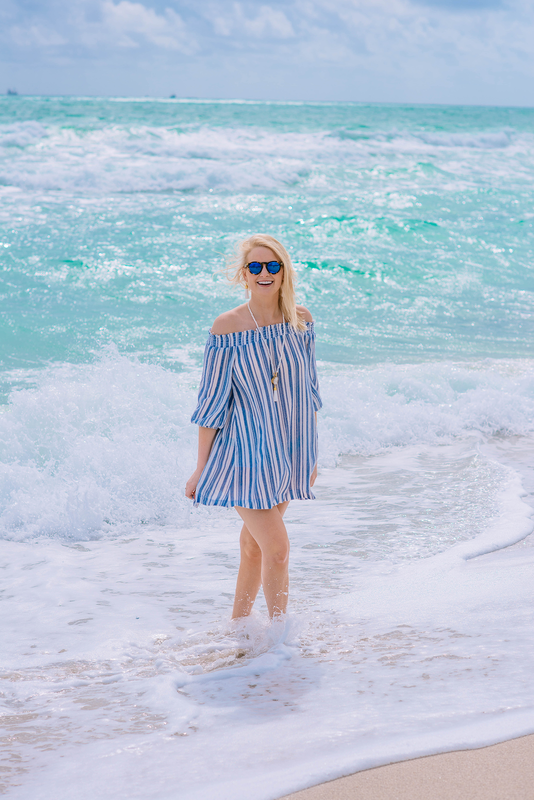 Nothing like a little beach trip to really get you in the mood for spring and summer! There’s also nothing like stepping off a plane from a really lovely weather destination to an arctic front at home. I was NOT dressed appropriately when arriving to Dallas last night! Brrr!!! I’m still defrosting. It was so nice to wear all my new spring/summer purchases comfortably this week, although coming back reminds me I may have to wait another month or two to wear them here! One piece I was excited to get my hands on is this simple, chic and inexpensive cover-up. Apparently I wasn’t the only one, because it’s selling out fast! 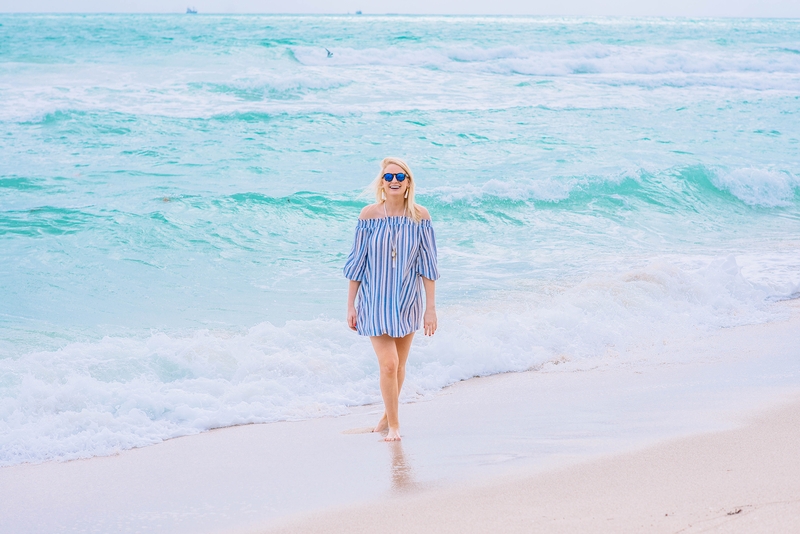 If your size is no longer available, I’d recommend this one or this one – both are $150 and have the same super cute striped look. They are so easy to throw on over your favorite bandeau bikini and go from the beach to lunch in a jiffy! 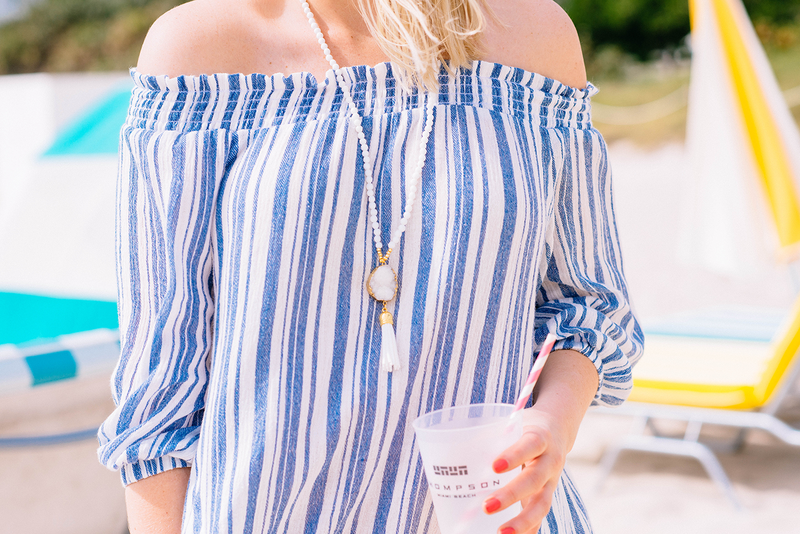 The perfect topper for these casual beach looks is this agate + tassel necklace from Laura Windsor Jewelry. It adds just the right amount of glam to create an effortless, gorgeous beach outfit! This cover is the cutest and love these photos. We stayed at the Thompson in August. It was amazing! Hope you enjoy! Love this SO MUCH! I had this same dress in a round up collage on my blog the other day! It’s perfect. Also, I just realized your sister doesn’t ship to Canada. :( Was def contemplating a pair of earrings, they are so fun for summer! So fun! Loving all the bright colors and that cover-up… perfection! Love! Where in Miami is this? I’ve been dying over all your Florida photos- so good! I just love these photos! We had some pretty weather here last weekend and now I’m beyond ready for spring. Love your dress – hope you have a great weekend! How cute are these picturs! Looks like your trip to Miami was a blast. Loving this off the shoulder dress! Cute sandals. Lucky beach day for you. 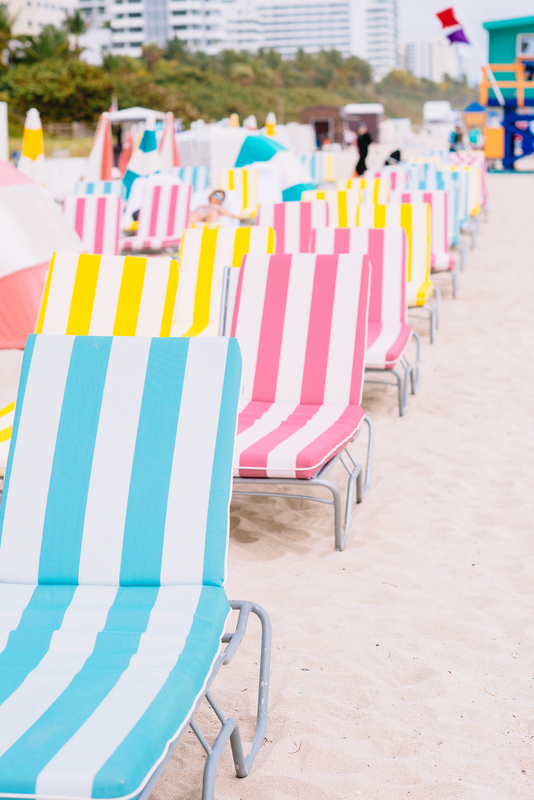 Your trip to Miami looked like so much fun! ok that dress is so pretty but those sunnies are awesome!!!! these colors are so amazing! I need to add Miami to my list! gorgeous cover up, and sunnies! You look so relaxed and glowy in these photos.